Quilts, Quilts, Quilts! | Arrrgh!!! Category Archives: Quilts, Quilts, Quilts! The past three or four days have been gorgeous! We have a small maple in the back yard that looked like it was on fire! We enjoyed the color with the sun rise, and through the day, until it lit up the back yard as the sun was setting. Then, we had a rainy night. The next morning it was as if the tree had blown a raspberry and dropped ALL it’s leaves! Our tiny back yard has a lot of wonderful trees, but this one speaks to my heart. I think we may have the stupidest squirrels in town. I bought one of those bird feeders that has the bar that closes off access to the seed when something too heavy (read: squirrels) sits on the bar. We don’t have a great deal of space along the patio where we could plant the bird feeder. I thought I’d chosen a place far enough from our flaming maple, but I underestimated the squirrel’s leap. However, I’ve been saved by the fact that they aren’t familiar with this style of feeder. They fly off the tree and land on the feeder, and then sit there. They don’t seem to understand how to slide down to the bin. I’m anticipating some fun watching them try to figure out how to hang off the edge of the feeder and scoop seed into their mouths. Scraps on a Mission has had their last meeting. We made 42 quilts this year, and shared them with 2 shelters, a hospice and the pediatric department at the hospital. Two members of the church have received quilts, too. During this session I needed to make four baby quilts for my extended family. Those were my only personal quilts during the summer. Today I started working on a quilt top that has been patiently waiting for me for several years. 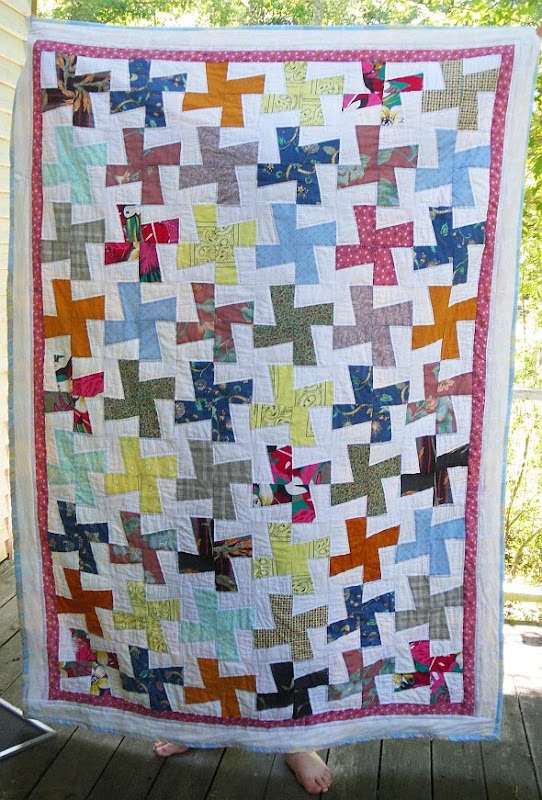 This one is the only quilt I’ve ever made of Depression era reproduction fabrics. It will be bright and cheery, with white to contrast the pink, yellow, orange, green, blue and purple fabrics. I have all the patchwork sewn (actually twice as much as I need), so I just need to sew the rows together. Once I see what is left over, I can decide whether I’ll make a second top, or two baby quilts. It’s good to be getting things finished! Dear Husband is studying for his oral and flight test, which is scheduled for a week from today. Each day we go over a portion of the study guide. I give him the subject and encourage him to tell me what he knows about it. I’m learning a LOT about soaring! I hope and pray he does well, and gets his certification this month. We’ve had a month of wretched excess thanks to birthdays and anniversaries. Both DH and I have October birthdays. Our anniversary was in September. The kids gather each year to celebrate their father’s birthday. DH decided this year that we would go somewhere where our granddaughters might not be able to order grilled cheese, or mac’n’cheese. We have watched them eat endless meals with no variety. So, he chose Benihana! It was a joy to watch them experience the “circus” part of the meal, and they were able to find loads of things that they would eat: chicken, shrimp, corn, noodles, soup and rice. We had a good time, and the kids will be talking about it for years to come. I may have told you that my quilting bee is meeting at the home of one of the other members. While we were packing up and moving, and unpacking, hosting the bee was more than I could handle. Our new home is half the size of our old house, but we have room for the bee and two husbands to sit at our dining room table. If more husbands decide to attend, I have two more tables where I can place them. Seating is more difficult, but we can still accomplish it. This is our Souper Supper, which is very fitting, given the cold temperatures we’ve had recently. It should be around freezing (which may feel warm! ), and we should be precipitation-free. Chocolate Cake with Raspberry filling, and/or Carrot Cake. I’ll have to ask DH what he wants to serve for beverages. We always offer tea (hot and iced), soda and water. He may wish to add wine to the menu. This will be the first time that many of my friends will get to see our new home, so we want to make them as comfortable as possible. Posted in Quilts, Quilts, Quilts! Well, we asked our favorite appliance repair company to come to check out our broiler and give us lessons on how to run our oven/broiler. It turns out the broiler is fine. It’s the users who need a little work. While he was here, I asked him if he could order a replacement for the flange in the disposal that was missing. If I ran the disposal, I had to place something above it, or wear what it threw back at me. He couldn’t help us with that, but offered to install a new disposal for us. Normally I would have said “No” to an offer like that, but I went for it. The inside of the disposal was rusted, and it sounded as though it was going to shake apart the counter when it ran. It turns out it was a good choice. There were signs of leaking at the bottom. So, we are now the proud owners of a much quieter, cleaner, neater garbage disposal! We’re going to resume Cookie Day! I have probably less than half the space that I once had, and only one oven, but with careful organization, we should be able to do this. I plan to bake the day before, and leave one refrigerated cookie ready to bake first thing that morning We’ll use the eating area off the kitchen for some prep, as well as the dining room table. I can clear the trestle table in the living room to store baked goods. I think it’s going to be a lot of fun. So far, there will be four of us, plus a five year old. I finished two blocks for my great-nephew’s Minecraft quilt, and just kept on working on other projects. I have a 25 block whirligig lap quilt in blues and yellow ready to be sewn together. I want to add white, yellow and blue borders to bring it up to about 44 inches square. It will be the first quilt finished for the 2015 season of Scraps on a Mission. I’m working with one of my nieces to make Minecraft quilt for her son. There are twelve blocks, and nine of them are based on an 8 by 8 grid. The most difficult thing about those blocks is having enough solid colors to accomplish the design, and then having to cut them into 2 1/2″ x 2 1/2″ squares. I’ve made the sword and the diamond pick axe blocks which are the same size block but on a 16 x 16 grid. Each square finishes out at one inch. I have a wonderful quilt top almost finished for my newest great great niece. Actually, it’s been finished for a couple of months, waiting for me to figure out how to do eyes and mouths for the bunnies that grace the quilt. I’m very aware that it is inappropriate to sew on small buttons for the eyes, so that left me in a quandary. Should I try to do something with my sewing machine, or try to draw faces with permanent markers? Well, I’m not much at drawing things. I’d hate to ruin a block that is already sewn into a quilt top. (Yeah….I know….I should have done the faces and THEN sew them together.) Everything about this quilt is a new experience for me. This is the first time I have ever tried my hand at machine applique, including trying Stitch Witchery and Heat and Bond and other types of sticky things. I’ve learned to use a blanket stitch, and learned that I might want to consider putting the stitch into proportion with the pattern I’m making. Today, I spent about three hours at my sewing machine trying to see if I could sew eyes or a wink, and a smile, or at least a mouth. I’d choose a design and sew it. Then I’d alter either the length or the width and run it again. At that point I’d mark the design number and the changes. And then I’d make some more changes. I took time to read through the manual. It’s large and not very well written, but I did find a magic button that elongates a pattern, and that was just what I needed! I practiced a bit, and think I’m ready. Now, should all the mouths and winks be in black, or white? Decisions, decisions, decisions. Thank God for all these babies who have joined my family. I learn new things with each quilt I make for them. Seven ladies who quilt come to visit at my house the first Friday of each month. We don’t have an official name, and we all seem to have our own specialty within quilting. We bring new acquisitions and old and new projects to share, and we chat. We chat and we eat. Usually at the meeting close to the Fourth of July we have an indoor picnic. Everyone signs up to bring something to share, and Dear Husband and I provide the meat. This year three of our members were going to be away, so we moved the picnic to the August meeting. Despite the shift, we still had just five members in attendance tonight, but it was a very pleasant gathering. Knowing that some of the ladies would be away, I decided that I should cook a bit more than usual. Another quilting friend had shared a recipe for pulled pork that I wanted to try. I planned to broil bratwurst and hot dogs for those who might not care for the pulled pork. I made a cold corn salad, deviled eggs, hamburger baked beans and Hot German potato salad. I also made a peach pie, just in case the dessert lady was one of the absentees. By 4:00 or so my feet really hurt, and I still had an hour of preparation to go. The back door opened and Dear Husband walked in, home from the lake. I had expected him around 8:00, but it was rainy, so he came home early. DH took over the broiling duties while I finished the potato salad. One lady brought spinach dip as an appetizer. Another brought ciabatta rolls. A third brought romaine, avocados and a wonderful lemony vinaigrette., and the fourth provided Key Lime pie. I knew we would have way too much food, so I’d picked up containers that I could use to send food home with each of the ladies. One of the ladies washed the plates and serving pieces for me, and another dried. I put things away and made a second container of iced tea, and we sat down to chat. It was a very laid back, lovely meeting. Oddly, no one bought anything to work on. Hopefully, that will make next month’s show and tell that much more exciting! And I am laboring! Saturday and Sunday I spent a good part of each day in my quilting studio, working on pieces of five different quilts. I made binding for one baby quilt and sewed the binding on to two others. I cut out the sashing strips for a quilt that will go to Scraps on a Mission, and assembled all of the horizontal rows of a 6 x 6 block quilt. Yesterday afternoon I sewed the first three rows of that quilt together, and hope to finish it tomorrow. I was in the kitchen, making the first zucchini bread of fall when the back door opened and in walked Dear Husband. He came home from the lake a full day earlier than I had expected, and told me that wind and waves forecast for today were going to make it too unpleasant to stay on the boat, even moored in the harbor. He also said his stomach was a little on the fritz. I hate to sail. My stomach is ALWAYS on the fritz when I am on a boat, so I just figured the weather was really whipping up and didn’t give the comment about the upset tummy much attention. Well, it seems he has the flu. Until the past year or two I would have told you that Dear Husband NEVER gets sick, but now that he’s in his mid-sixties he picks up little bugs now and then. Or, perhaps he was just more stoic about them before and hid them well. At any rate, he’s home for the day, taking it easy, reading a science magazine. I got up early this morning, intending to go out to weed as soon as the sun was up, but I stalled. It was about 56 when I checked the temperature at the NOAA site. DH and I had breakfast together and we talked about meals for this week and next. I checked to see what we needed from the store. Usually the first thing I do when I go out to work on the gardens is to feed the birds. I was working on that when I realized the mice and chipmunks had made a mess on the shelving above the seed bins. I cleaned that up, mixed up more seed, filled the bird feeders and then headed out with the weedeater. I got the area at the front of the house finished and then pulled the spent day lily stalks. I had the chance to look over the beds and plan my attack over the next few days. Happy Labor Day to you all! Posted in In the Garden, Quilts, Quilts, Quilts! My sister, Frankie, has been working on her first quilt in about fifteen years. She called me one day in late June or early July, to say that she was standing in the middle of a fabric sale, and could I help her figure out how much she needed to buy!? She decided to do one of Eleanor Burns’ “Quilt in a Day” quilts. This one is the log cabin block. She’s made 24 blocks in shades of turquoise and tan/brown. She wanted to create the idea of sand and waves. The lovely part of all this is that we have shared the work on the top. Over three visits, I did the sewing, and she pressed the blocks and handed me the next strip to be added. I think if we had had one long day without any obligations, we might have gotten it done, but both our lives are so busy that we had to take a little time here, and a little time there. Frankie gets to assemble the blocks into the top, and add borders. She will also be making a variable binding from the strips that were left over ( you know…..”Use it up, wear it out, make it do or do without). We both love saving money and being frugal with what we have. I’ve really enjoyed this time with my sister. I wish I could have this same experience with all the ladies in my family. Elegante Mother appliqued several things that I quilted, but she is the only other member of the family with whom I’ve collaborated. I have pictures of the blocks, laid out on the floor in the pattern Frankie liked for her quilt. I need to download them and send them off to her. With a little bit of prompting, perhaps I can get her to post them for you at her blog. And when I get pictures taken of MY last quilt for the year, I’ll post them, too. My sister, Frankie, of Just My Opinion, is not happy to be just my sister. She has also applied to be my Fairy Godmother and I think she may beat out all the other contestants! Last weekend, Frankie and her youngest daughter, our artist-in-training (AIT) came for a visit. It was MUCH too short, but they were able to arrive Friday night, and could stay until Sunday morning. Believe me, if you could see the Day-Timers for these two women, you would know how blessed I was to have even that much of their time. I THOUGHT that the reason for this visit was to blitz the sewing of a new quilt top for Frankie. This summer she called me while she was standing in the midst of a fabric sale (be still my beating heart!) and asked me how much fabric she needed for a log cabin quilt. I was surprised to be able to give her any kind of sensible answer, but she seemed happy with my response, and brought the fabric to show, the next time she visited. I’d cleared off the table in the quilt studio in preparation for cutting the strips. I thought we would start early Saturday morning and zip right through this to give her a completed top to take home. She had other ideas. It was supposed to rain on Saturday. The clouds were out west, and I thought it would be rainy all Saturday. Frankie had mentioned that she wanted to help me clean up my gardens. It’s about a month too early to put them to bed for the winter, but they were looking pretty woolly, and needed attention. She decided that we needed to get out and put a couple of hours in before the rain came. So, we put on our gardening clothes and gloves and trouped out. Frankie decided to start in the herb garden, which of all my gardens needed the most help. The herb garden sits to the north of the house, even with the kitchen. I can look out over it as I work at the sink. She asked me what could go, and what needed to be trimmed, and went off to collect her tools. She brought the entire compliment of loppers and rakes and hoes and shovels from home! The area immediately to the east of the herb garden (on the north side of the garage) is rather like the poor relation in my yard. It really needs to be cleared, so that I can have a paved patio installed, but at the very least, I should put down landscaping paper and mulch or gravel. It was a mess of weeds and equipment, and it was driving me crazy. The front of the house looks vastly improved, and so does that area north of the garage. But, the herb garden…….WOW! Frankie cleaned the walkways. ALL of the walkways! I tend to get one side or the other when I get to working on the garden, but she got the entire path! Even the little areas that lead to the lawn, where I traditionally heap up weeds waiting to be picked up! It looks astonishing! I know…a picture is worth a thousand words. I promise to take pictures and post them here. Frankie cut back the rudbekia, and the oregano and the chives, and the lemon balm. She ripped out the spent basil plants, but had the sense to leave the lemon verbena and the columnar basil. We decided to leave the purple coneflower, which looks really untidy right now, but it feeds the finches, so it gets to stay another month. We both like the look of the lamb’s ears that has escaped the formal bed to grow in the walkway, so we agreed to leave those, too. It looks absolutely wonderful. I should also sing the praises of AIT, who got out of bed to pick up loads of weeds and run them to the back in a wheelbarrow that had a tire going flat! She made things fly for us, and I can’t praise her enough for her part in all this. We worked for close to four hours! I was really glad to “tweet” and call a halt. We were both at places where we were willing to quit, in other words, DONE! My herb garden is glorious! Thank you dear Sis and Niece for all you did! Oh…I forgot to mention that they spent about half an hour pulling grapevines from our shrubs. I can’t wait to see the finished project that Frankie is working on. I believe she is creating a grapevine Christmas tree. As for the quilt top, it was interrupted once more. We all showered and had lunch and the girls went to buy a pair (or more) of shoes for AIT. She is a college student and has discovered the necessity of having good shoes. She found a pair of shoes and a pair of winter boots. Frankie found a pair, too, so shopping was a success. When they returned, tired, I cracked the whip, and insisted that we work on cutting the strips for the quilt! I ironed fabric and handed it to Frankie, and she cut the strips. We were two thirds of the way through the project when I had to fix dinner, so she kept cutting and got it all done. AIT and I worked on dinner, and we put out a bowl of mixed fruit, tuna melts on English muffins, and a huge bowl of salad with strips of chicken and practically every veggie in the house! After dinner, Frankie thought she was going to be allowed to rest. There was some mention of aching muscles, and how long a day it was, but I was of a mind to SEW! I told her she could sit, but I wanted to make up at least one block to see what it looked like. Well, with the method she was going to use, I actually ended up with three finished blocks and part of eleven more, but who’s counting? I know she was exhausted, but there was a satisfaction in being able to put up those blocks to see what her quilt was going to look like. She was surprised, as we frequently are until we can see them on the design wall, but not unhappy with how they looked. I wish she had left them to me. I’d have been happy to complete the blocks for her in return for all the gardening help she gave me. Perhaps, when the project is further along, Frankie will post pictures of the quilt. We breakfasted together Sunday morning, before seeing our visitors off. AIT needed some time to work on her homework, and they have a long drive home. I always hate to see them go. Dear Husband and I will drive down to their home in Indiana in October, and their entire family will be with us for four days at Christmas, but I’ve been spoiled this summer, seeing my sis several times a month. We may need to live closer together when we are all retired! It was a GREAT weekend, and it’s been a good week so far. Thank you, Frankie and AIT, for all you did. Don’t you all wish you had family like this!??? I mentioned some time ago that I was working on quilted purses for my nieces. I finished them, and they were given as gifts late last year. I have a picture of one to show you. My niece has always been interested in frogs and things of that sort. I found an incredible fabric that had chameleons or newts on it, and bought it even though I didn’t have a project in mind. I found a pamphlet with instructions for quilted totes, duffel bags, purses, and accessories, and figured that would be great for quick gifts. Unfortunately, what I didn’t stop to think about was that I was going to have to quilt the fabric, rather than using a pre-quilted fabric. Of course, I did it by machine, but it took me days to get it right. I needed to work out tension and the needle size to get my very ancient machine to cooperate. I ripped out a lot of stitches and re-did them, until I got them right. And having said that, the job was still that of a novice at machine quilting. I did a similar purse for her older sister which was in red and black with gold Japanese calligraphy. She is very into anime (or was….I hope she still is), so that’s what helped me to design her purse. I may have a picture of her purse to share one day.